Unless you are in a major city, the likelihood of finding a local, qualified data recovery company is going to be difficult at best. There are really only a handful of good companies out there, and most are going to be concentrated in New York, California, Florida or Texas. Some of our customers are nervous about shipping their media at first, but if you take the proper precautions, there’s really nothing to be worried about. And just because a company says they are local, that isn’t always the case. Many simply use virtual offices to show a local presence and they still end up shipping your media somewhere else. We receive hard drives from all over the world, so it doesn’t matter where you are, we can get your recovered data back to you quickly and efficiently. CLICK HERE to complete a brief online form, which will create your case within our ticket system. Again, there is no charge for the initial evaluation on any type of device, so there is absolutely no obligation to have us look at your failed storage media. Simply complete the form below as much as possible, and when completed, package your drive as illustrated in the photos below and include your NAME and the CASE NUMBER that was issued to you. After you’ve established your case within our ticket system, all you have to do now is ship your media to us. Shipping your hard drive or other storage device is very easy, and safe as long as you take the proper precautions. If you have a hard drive, try to put it in an anti-static bag if you have one (see pictures below). If you don’t have an anti-static bag, you can wrap it in aluminum foil. This is done to prevent any electrostatic discharge (note: external hard drives do not need to be wrapped in anti-static or foil). Then wrap the device in 4 or 5 layers of bubble-wrap, and place it in a well fitting box so that it doesn’t move around. Add extra padding if needed. We recommend shipping via UPS or FedEx if at all possible. Just ship to the address provided on the confirmation page when you create your case. We have locations in Florida and Texas. Include a note with your NAME and the CASE NUMBER that was issued to you. Make sure to include a note with your NAME and the CASE NUMBER issued to you. **PLEASE NOTE** If you are local, you are more than welcome to bring your storage device to our lab. However, since data security is a primary focus, we are NOT a walk-in business. In other words, we keep our facility locked 24/7…and it will look like we are closed even when we are open. You will need to call ahead of time (1.800.717.8974) to let us know so we can have someone up front ready to meet you. We have labs located in Texas and Florida. Once we receive your media, we will begin the initial evaluation. 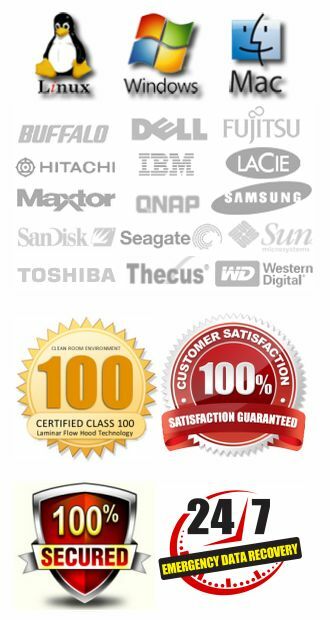 We generally complete most evaluations within 24 hours of receipt. When completed, we will let you know, what we have found and the exact cost of the recovery should it be successful. 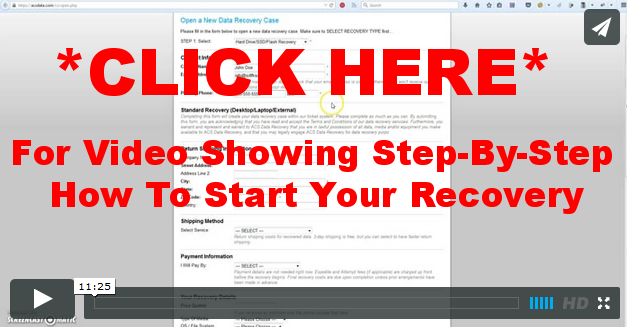 We will not proceed with any recovery attempts until we verify costs with you first. You can then elect to proceed with the recovery or not. If you decide not to proceed, you are only charged for return shipping of your drive if you want it shipped back. After the evaluation has been completed, and you’ve authorized us to proceed, we will begin the actual recovery process. Most recoveries, unless Expedited, will require about 5 to 10 business days to complete. If your media has been physically damaged, we may need to order parts, and in many cases a recovery may require 4 or 5 attempts before it can be fully completed. You most likely won’t receive daily updates during the recovery process, but we will update you at critical stages. You can always Log In To Your Case and ask for updates, or post questions if you like. During the recovery process we will start by repairing your media if necessary. We will not repair it to a point where you would ever use it again, it’s just so we can create an image of your data. Once the imaging process has completed, we will then rebuild the file structure and pull the data from the image. The final step in the recovery process involves transferring your data to a destination drive. We include a new external storage device (up to 2TB) with each recovery. 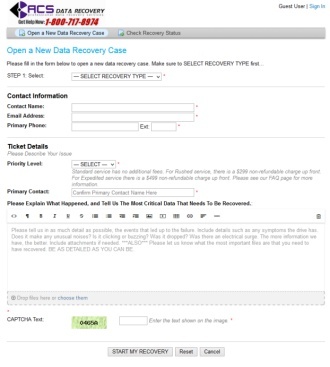 Once the data is transferred, we process the payment, and ship your recovered data back to you. We will hold on to the image of your media or the source drive for up to 10 days just to make sure you’ve received everything OK, and have had a chance to review the recovered data to make sure everything looks good. After 10 days we will wipe the image from our storage device.